Dan "The Man" Suied Wins the Mega Stack Challenge! 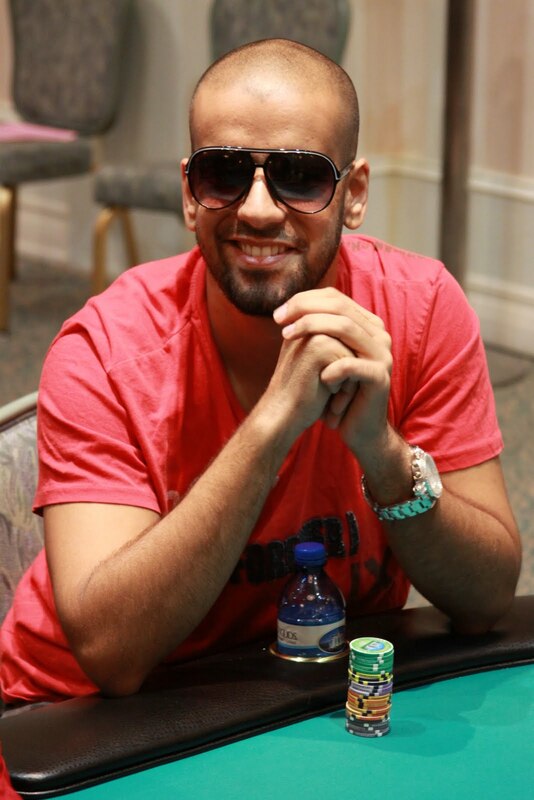 Congratulations to Dan Suied, winner of the $1,650 NLHE Mega Stack Challenge Main Event. 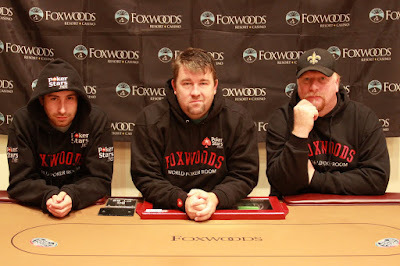 Be sure to join us in October for Foxwoods World Poker Finals here at the Foxwoods Resorts Casino! Podell's pocket pair never even made it past the flop as the board came [As][Kh][7h][Qc][9d]. 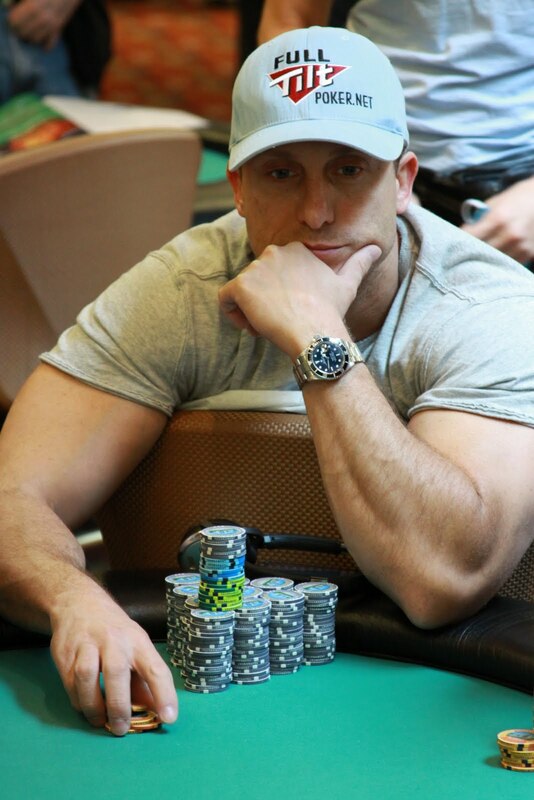 Suied paired his king to win the pot and eliminate Podell in 2nd place. 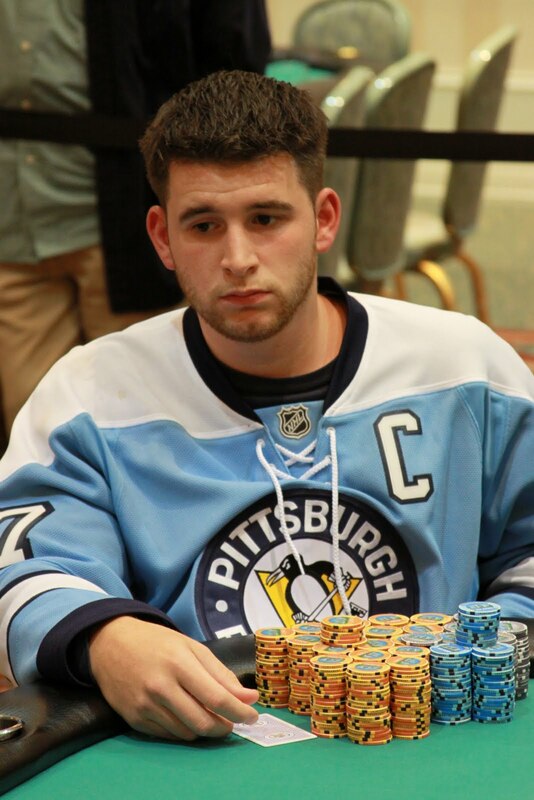 On a checked down board of [9d][8h][3c][8c][9c], Mike Dentale checked and Marc Podell bet 650K. 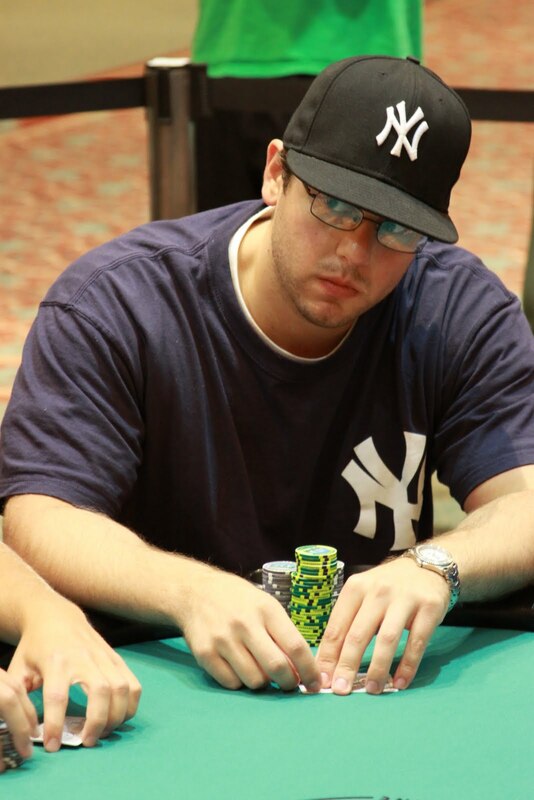 Dan Suied mucked his hand and Dentale then moved all in for an additional 1.72 million. 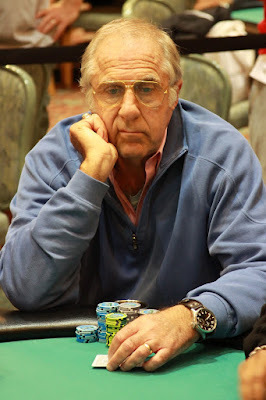 Podell announced "If you have the boat, you're good..." as he turned over [Kc][7c] for the flush. Dentale tossed his cards into the muck and takes home 3rd place. 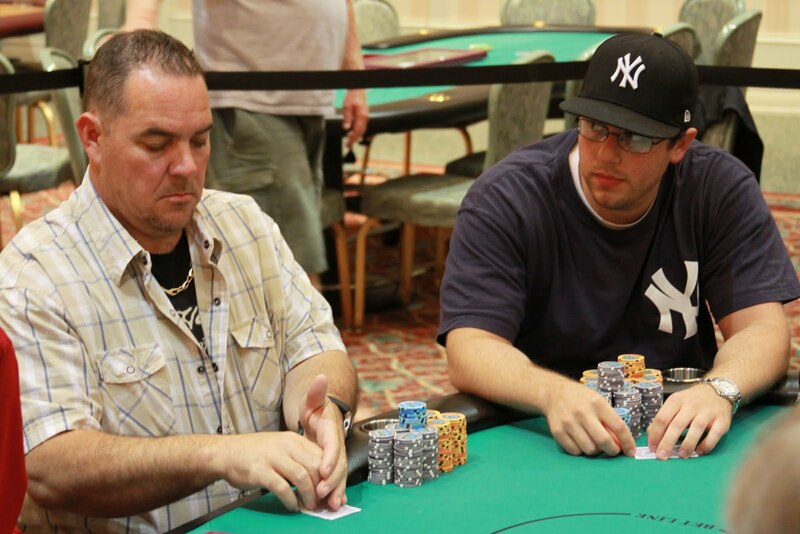 Marc Podell and Dan Suied are now heads-up for the Mega Stack Challenge Main Event title! Santos needed help but didn't receive any when the board ran out [Jc][9c][2d][2h][Kc]. 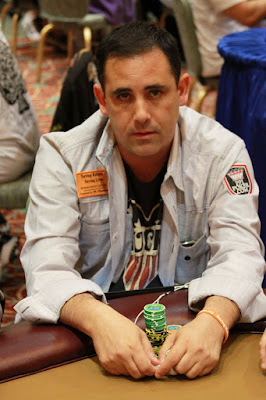 Dentale won the pot and eliminated Santos in 4th place. 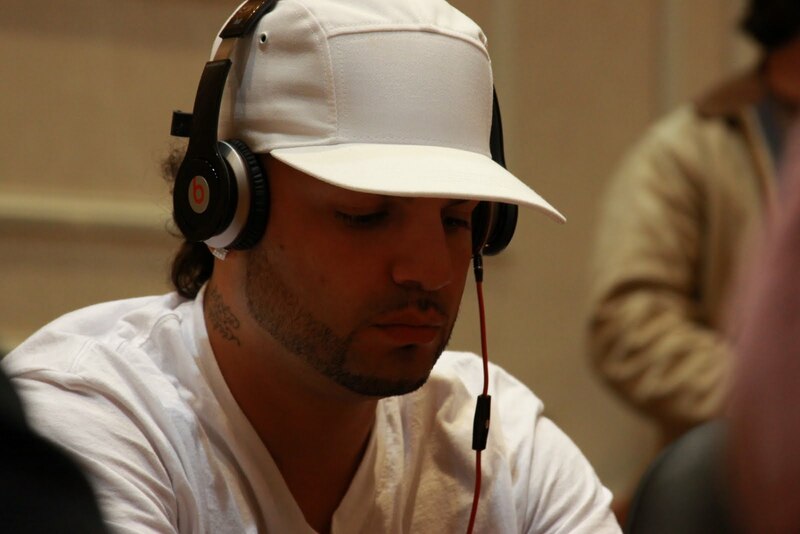 The four player had agreed to a 4-way chop with money left on the table previous to Santos's elimination. They requested that the chop numbers not be listed. 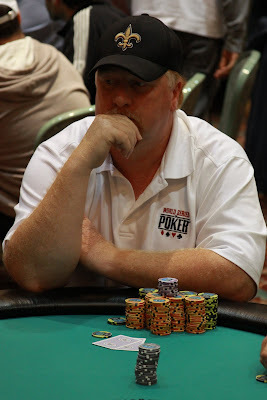 The board ran out [Kh][9h][7h][4c][Th] and Podell's hand held up to win the pot and knock out Lang in 5th place. Haddad was ahead until the flop came down [Qs][7h][4c]. 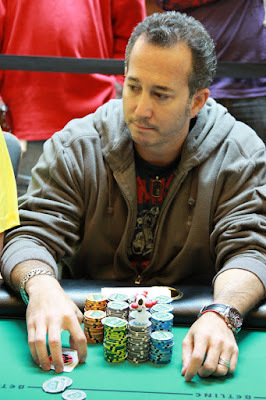 Podell took the lead with his pair of queens. The turn was the [Qd] and Haddad needed a nine on the river. However, it came down the [Kc]. 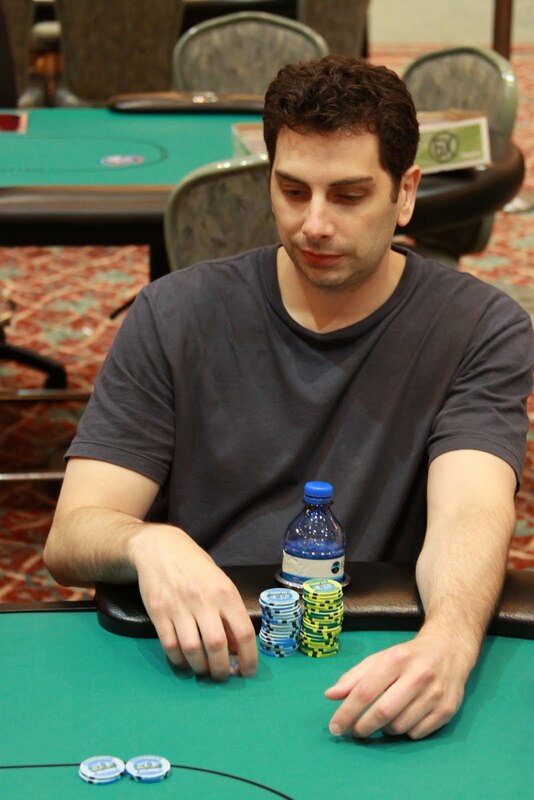 Haddad had Podell covered, but only by 35,000 chips and he was eliminated on the next hand by Mike Dentale. Play Resumes at the Mega Stack Main Event. The six remaining players have returned from dinner break and cards are back in the air. The blinds have been increased to 50,000-100,000 with a 15,000 ante. The six remaining players are now on their one-hour dinner break. The flop came out [Ts][6s][2d], giving Suied the lead with a pair of tens. The turn was the [Ks] and Bianco picked up additional out with both straight and flush draws. 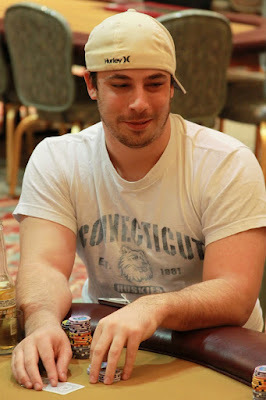 However, the river was the [Td] and Suied won the pot to eliminated Bianco in 7th place. The flop came out [9d][7s][5c] and Legendre's tens were still good. The [4c] on the turn didn't change anything but the rail exploded when the [Kh] hit the river. 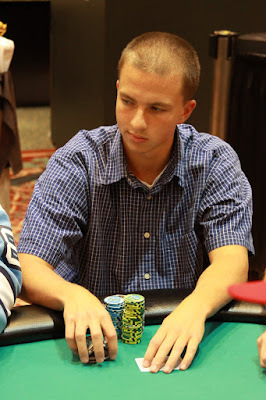 Podell took the pot with his pair of kings and eliminated Legendre in 8th place. The eight remaining players are now on a 10-minute break. When they return, the blinds will be increased to 30,000-60,000 with a 10,000 ante. The board came [4h][3s][2s][4s][6d] and Suied's pair held up to take the pot and knock out Koerber in 9th place. 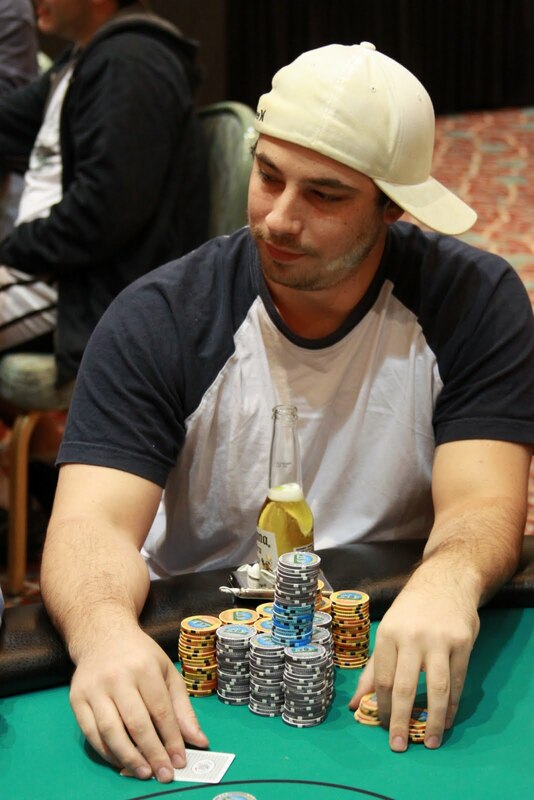 The board came [9s][5c][2h][2d][3h] and Santos's pocket eights held up to win the pot and eliminated Perry in 10th place. The players are on a short break while the tournament officials color up the orange 1,000 chips. When play resumes, the blinds will be increasd to 20,000-40,000 with a 5,000 ante. We are down to the final ten players in the $1,650 NLHE Mega Stack Challenge Main Event. Players are currently redrawing for seats at the final table. The players have been active early on the this final day and we are now on the final table bubble with 11 players remaining. The blinds have been increased to 15,000-30,000 with 4,000 ante. Play has resumed at the $1,650 Mega Stack Challenge Main Event. The blinds are 12,000-24,000 with a 3,000 ante. There are 33 minutes left in level 24. Play resumes at noon tomorrow and there will be 33 minutes left in level 24. With 14 players remaining, play has come to an end for the day. Play will resume tomorrow at noon in the Foxwoods Poker Room and will continue until we have a winner. Chip counts and seating assignments will be posted shortly. There are now only 18 players remaining. We are currently redrawing for seats at the final two tables. When play resumes, the blinds will be 10,000-20,000 with a 2,000 ante. The 24 remaining players are now on a 10-minute break. When they return, the blinds will be increased to 8,000-16,000 with a 2,000 ante. The average chip stack is now just over 533,000. Play will continue tonight until midnight or the final table, whichever comes first. 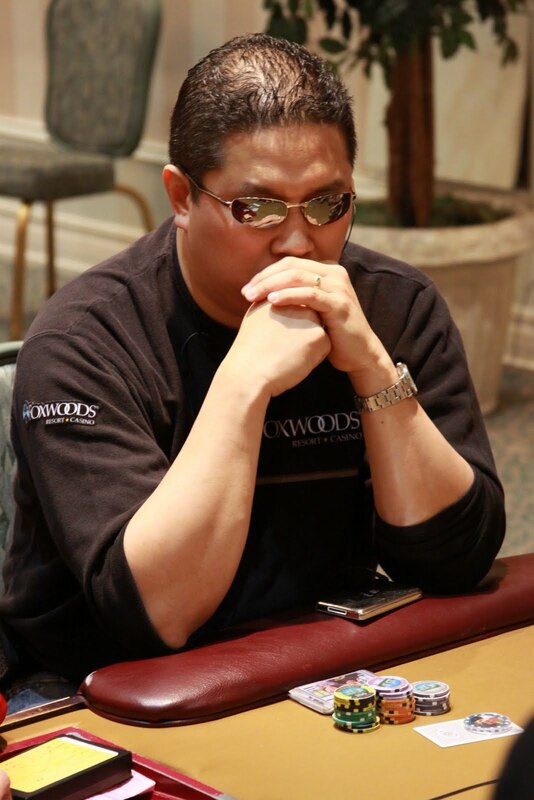 Foxwoods Poker Room Spokesperson Bernard Lee talks to Jay "WhoJedi" Newnum about the Foxwoods Mega Stack Challenge and the upcoming World Poker Finals. The 36th place players was just eliminated and all players are now guaranteed at least $3,817. Play is scheduled to continue tonight until midnight or the final table, whichever comes first. Play Resumes on Day Two of the Mega Stack Main Event. The 36 remaining players have returned from dinner break and cards are back in the air. Top 35 finish in the money. The 36 players are now on a one-hour and ten-minute dinner break. Top 35 players will finish in the money. We are down to the final three tables in the $1,650 NLHE Mega Stack Main Event. There are 36 players remaining with top 35 spots finishing in the money. We are now approaching the money bubble as there are 40 players remaining with top 35 finishing in the money. 2009 WSOP Main Event Runner-Up Darvin Moon talks to Jay "WhoJedi" Newnum on Day Two of the Foxwoods Mega Stack Challenge Main Event. Vinny Pahuja has been eliminated on Day Two of the Foxwoods Mega Stack Challenge Main Event. There are now 44 players remaining and the blinds have been increased to 3,000-6,000 with a 500 ante. 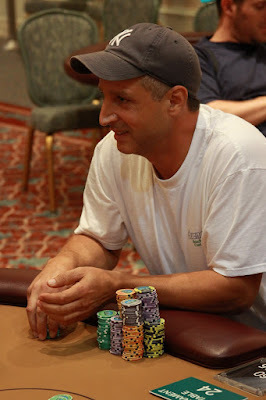 Early on Day Two action at the Foxwoods Mega Stack Challenge Main Event, Dan "The Man" Suied was all in with pocket threes against his opponent's pocket aces. He was walking away from the table when he spiked a three to stay alive. Since that point, Suied has been a one-man wrecking crew. 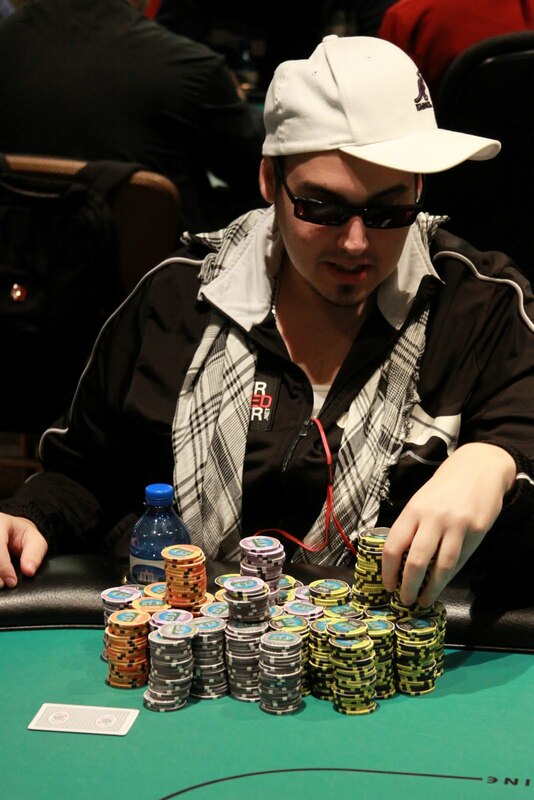 He has eliminated a number of players and built his stack up to over 1,000,000 chips. 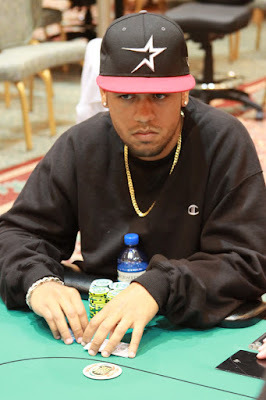 There are now 47 players remaining and the chip average is just above 272,000. The top 35 spots will finish in the money. 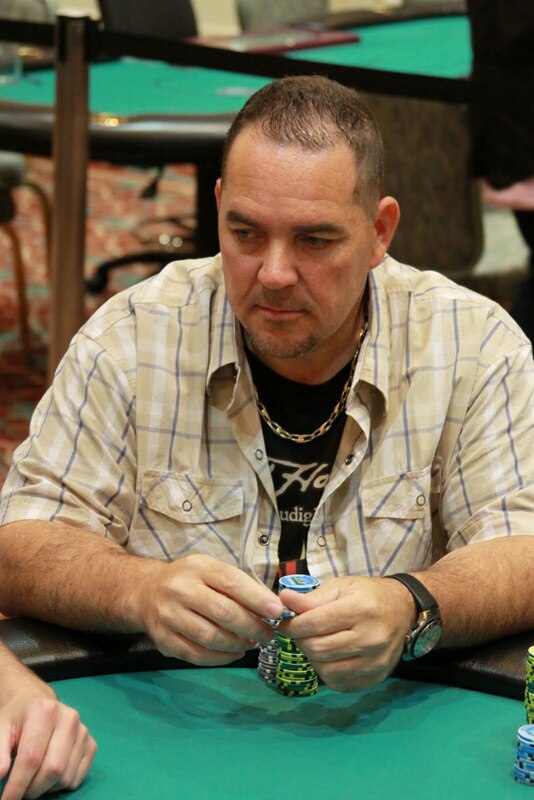 Chris McCormack is one of our early casualties here on Day Two of the $1,650 NLHE Mega Stack Challenge Main Event. Our apologies, we have had some techincal difficulties but are back up and running. There are now only 54 players remaining and the blinds have been increased to 2,500-5,000 with a 400 ante. The average chip stack is now just over 237,000. 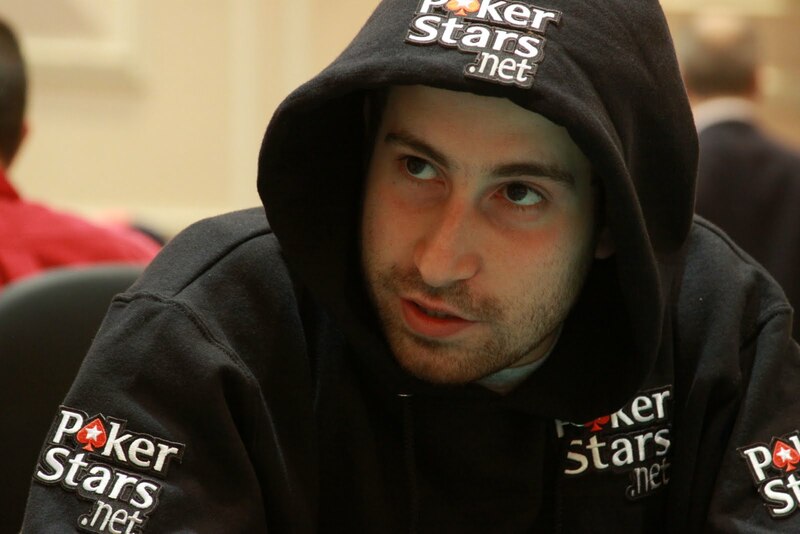 The board bricked out for the 2010 WSOP Main Event Final Table chip leader and he was eliminated from the tournament. 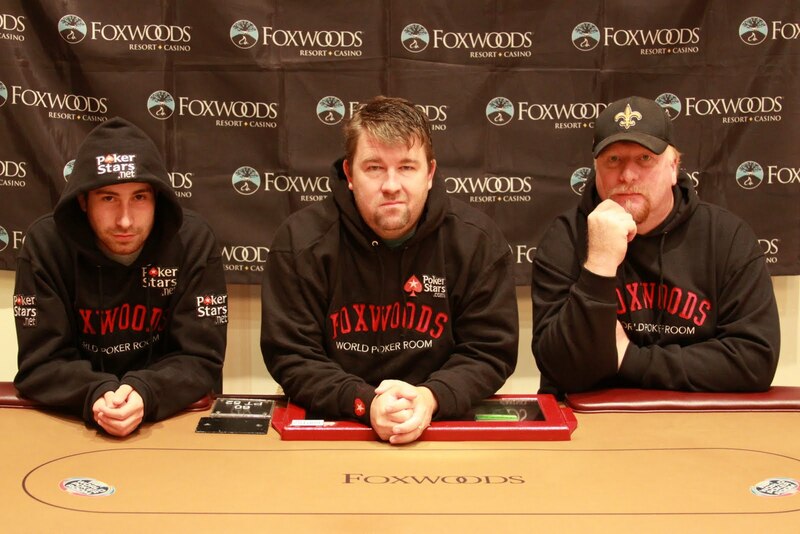 Thanks again to Jonathan, Chris Moneymaker and Darvin Moon for co-hosting this great Mega Stack Challenge event. 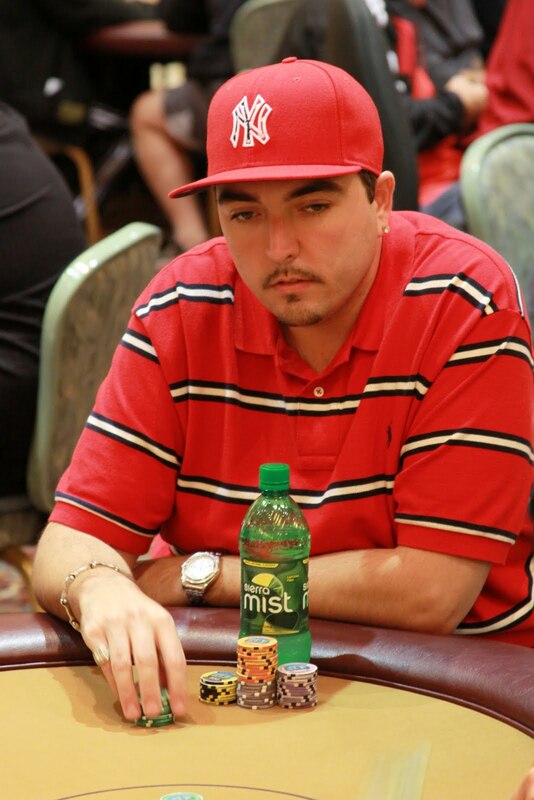 Best of luck to Jonathan Duhamel in November as he looks to win the WSOP Main Event! Cards are back in the air for our 98 remaining players on Day Two of the $1,650 NLHE Mega Stack Challenge Main Event. The blinds are starting at 1,500-3,000 with 300 ante. All levels are one hour in length now. Day One of the Foxwoods Mega Stack Challenge Main Event has come to an end with 98 players remaining. Top 35 will finish in the money. Mega Stack Host and 2010 WSOP Main Event Final Table chip leader Jonathan Duhamel ended the day with 66,500. Play will resume at noon tomorrow in the Foxwoods Poker Room. Thanks for watching and have a great night!!! This will be the final level of the day. There are now 113 players remaining. One of the massage girls here in the tournament area was vigorously looking around on the floor for something. When Corrine was asked what she was looking for, she informed the table that she had lost a $100 bill somewhere. After the bill was nowhere to be found, the players at the table decided to all pitch in to make sure the hard-working massage girl got her money. Corrine clearly was very grateful to all the players who made sure she didn't go home short on her pay. 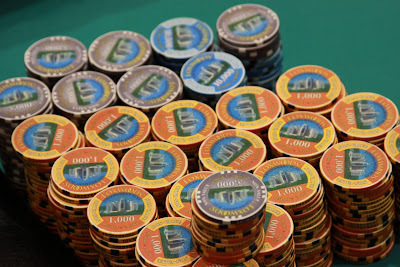 There are 134 players remaining and the average chip stack is just under 96,000. When they return, the blinds will be increased to 1,000-2,000 with a 200 ante. Mega Stack Challenge Co-Host and 2009 WSOP Main Event Runner-Up Darvin Moon has been eliminated from the Main Event. 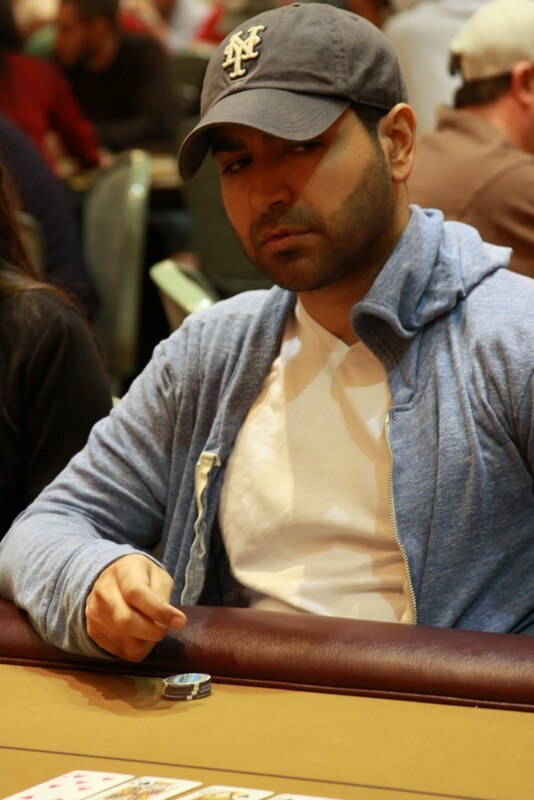 Darvin got all in with top pair against his opponent's flush draw on the flop but was unable to fade his opponent's outs. With the elimination of Darvin Moon and the earlier knockout of Chris Moneymaker, Jonathan Duhamel is only host still alive in the Main Event. The blinds are now 800-1,600 with a 200 ante. There are approximately 150 players left and the average is just over 85,000 chips. 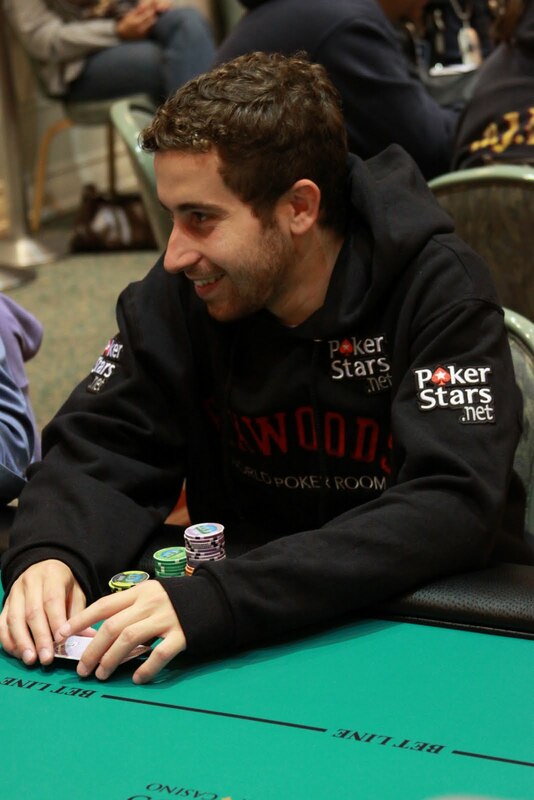 The players just completed a short break and are now back at their tables. The blinds have been increased to 600-1,200 with a 100 ante. 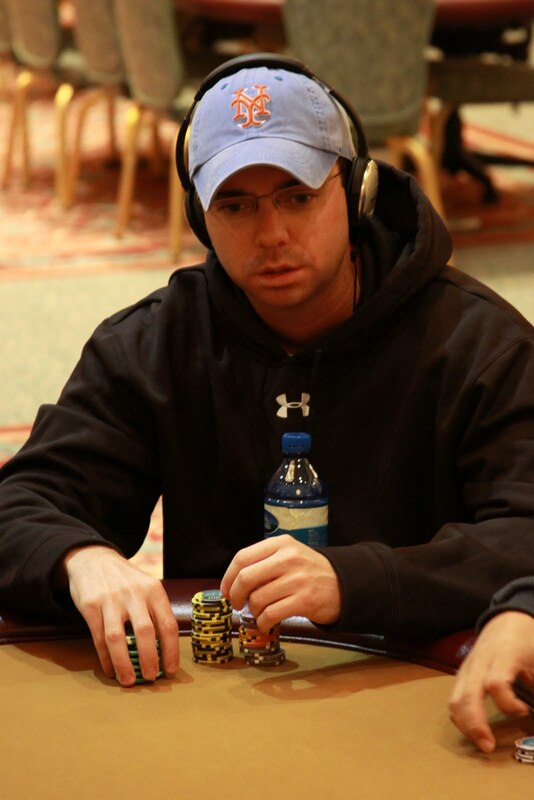 There are approximately 173 players remaining and the average chip stack is just under 74,000. 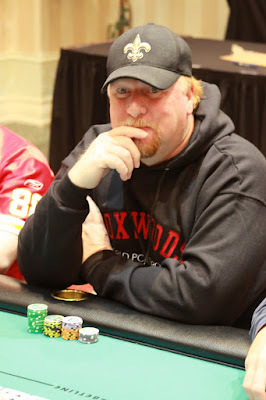 2003 WSOP Main Event Champion Chris Moneymaker talks to Jay "WhoJedi" Newnum about the Foxwoods Mega Stack Challenge and his upcoming schedule. The blinds are now 500-1,000 with a 100 ante. Players are back from dinner break and the blinds have been increased to 400-800 with 100 ante. There approximately 221 players remaining in the $1,650 Mega Stack Main Event. Players are now on a 70-minute dinner break. Lee flopped a set and his opponent was four to the flush. 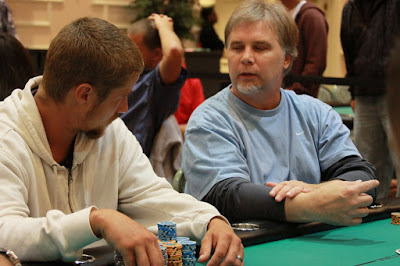 The turn was the [Kd] but the river was the [9c], giving his opponent the flush and the pot. 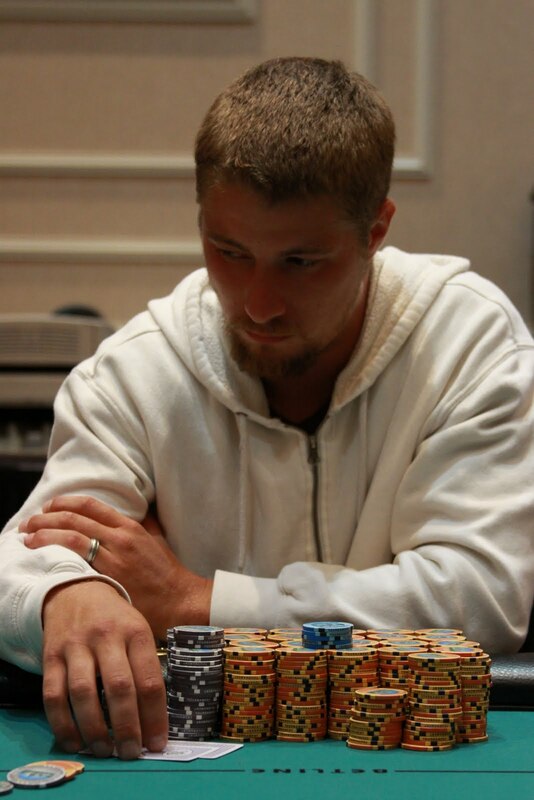 Lee was eliminated from the Main Event of the Mega Stack Challenge. The blinds are now being increased to 300-600 with a 75 ante. There are approximately 247 players remaining and the chip average is just below 52,000. After building up his stack early, 2010 WSOP Main Event 131st place finisher Ryan Eriquezzo got his opponent all in with A-10 against Eriquezzo's A-K on an ace high board. 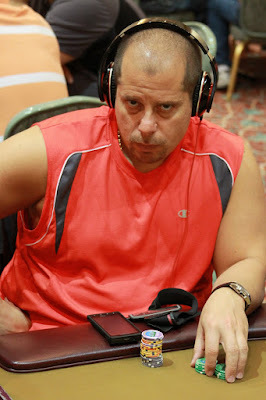 With only one card to go, Eriquezzo was in great shape to hold a monster stack early on. Instead, a ten peeled off on the river and left Eriquezzo on the wrong end of the pot. He was eliminated shortly after. 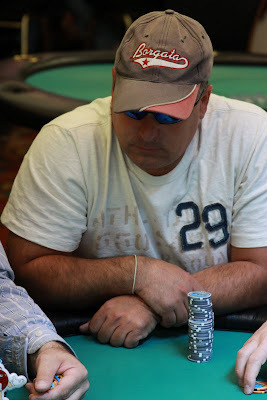 We had a total of 320 players in the $1,650 NLHE Main Event at the August Foxwoods Mega Stack Challenge. The blinds have been increased to 200-400 with 50 ante. 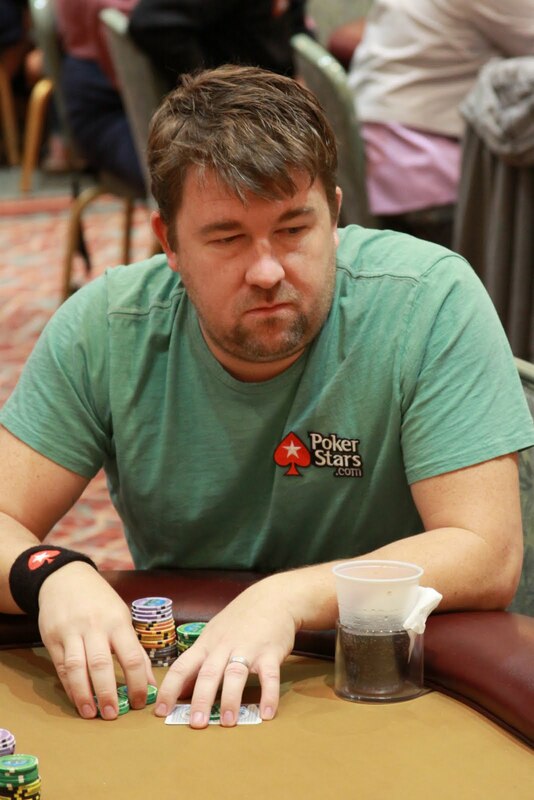 2003 WSOP Main Event Champion Chris Moneymaker has been eliminated from the Mega Stack Challenge Main Event on Day One. Luis Vazquez, winner of the 2010 Foxwoods Poker Classic Main Event, has been eliminated early on Day One action. 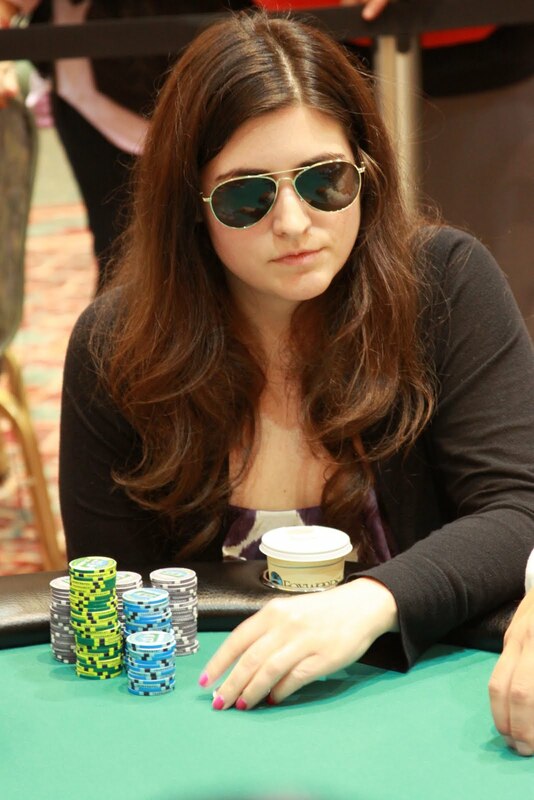 When play resumes, the blinds will be increased to 150-300 with a 25 ante. 2010 WSOP Main Event November Nine chip leader Jonathan Duhamel talks to Jay "WhoJedi" Newnum about the Foxwoods Mega Stack Challenge and what he is doing in preparation for the November Nine. Registration is still open here at the Foxwoods $1,650 NLHE Mega Stack Challenge Main Event and we are already over 300 players registered. There were no players eliminated in the first round of play. 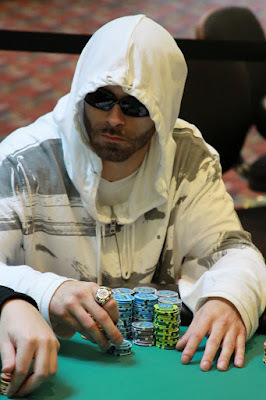 WSOP Main Event Final Table chip leader Jonathan Duhamel just gave the "Shuffle Up and Deal" announcement and cards are in the air at the $1,650 Foxwoods Mega Stack Challenge Main Event. The blinds are starting at 25-50 and each player starts with 40,000 in chips. 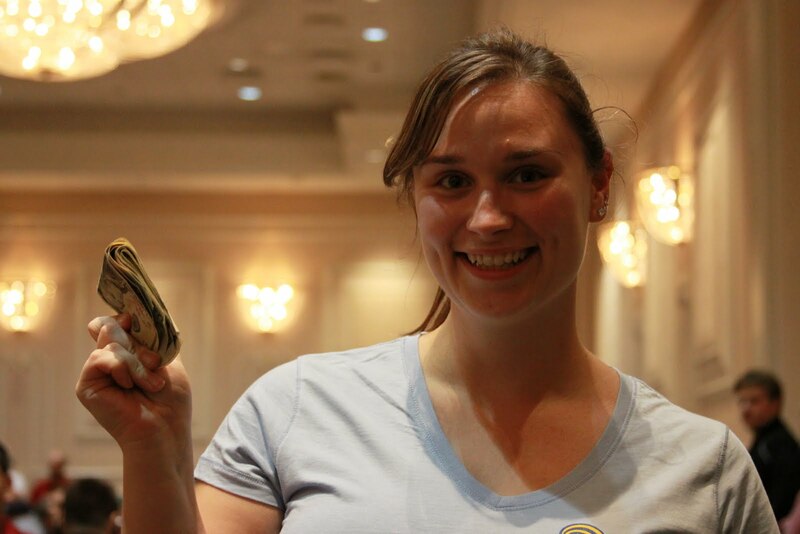 We are just over two hours from the start of the $1,650 NLHE Mega Stack Challenge Main Event. Play kicks off at 11am and late registration will be available. Come join 2010 WSOP Main Event Final Table chip leader Jonathan Duhamel, 2003 WSOP Main Event Champion Chris Moneymaker and 2009 WSOP Main Event Runner-Up Darvin Moon in today's $250,000 Guaranteed event! 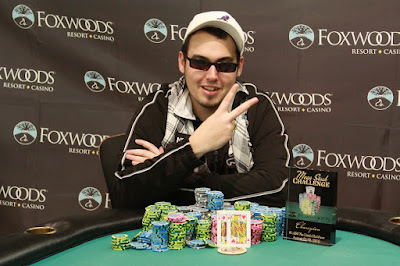 Brad Harper is officially the champion of the $560 NLHE Mega Stack Challenge event at the Foxwoods Resorts Casino. After the five-way deal, he takes home $35,615 and the trophy. Congratulations Brad and be sure to join us tomorrow at 11am for the start of the $1,650 NLHE Mega Stack Challenge Main Event! The five remaining players have all agreed to a deal and the tournament has concluded. Schultz had flopped top pair but was in bad shape behind Harper's set of kings. The turn was the [8s][ and the river was the [Ts]. 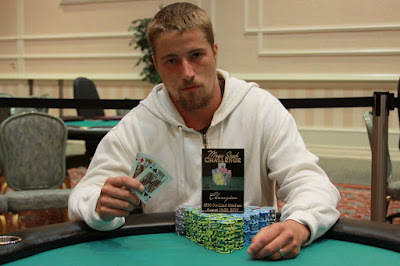 Harper took the pot and eliminated Shultz in 6th place. The six remaining players are on a short break. When they return, the blinds will be increased to 40,000-80,000 with a 10,000 ante. The board came [Ts][4s][2h][7d][2s] and Montes paired his ten to win the pot. Brackesy was eliminated in 7th place. The seven remaining players have worked out a deal. Seventh through fourth place will all earn $20,000. Second and third place will take home $40,000. First place will win $41,615 and the trophy. 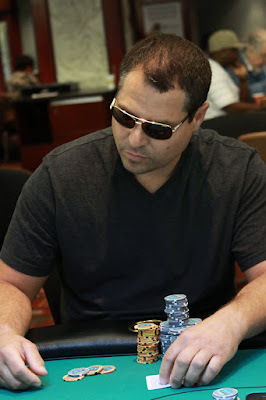 The board came out [As][Tc][9h][7s][Jc] and Montes took the pot with his pair of kinds. 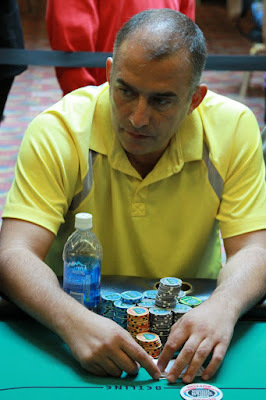 Olivieri was eliminated in 8th place. The blinds have been increased to 30,000-60,000 with a 10,000 ante. Kenneth Sellers has just been eliminated from the tournament after two consecutive brutal hands. 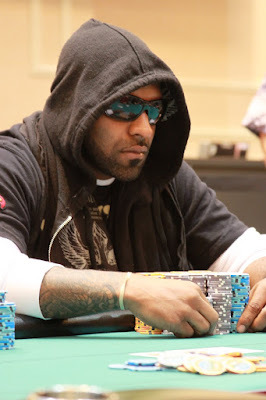 First, Khalid Riley moved all in on a board of [8s][6s][2d] for 1,375,000. Sellers made the call and showed [Jd][Jh] to Riley's [7h][7s]. However, the turn came the [4s] and the river was the [As], giving Riley a flush and the pot. The board ran out [Kd][Td][3c][2h][5h] and Schultz paired her king to win the pot. Sellers was eliminated in 9th place. 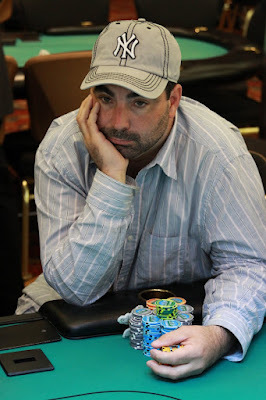 The board ran out [Kc][Tc][5d][3s][Qh] and Schultz's ace high won the pot. 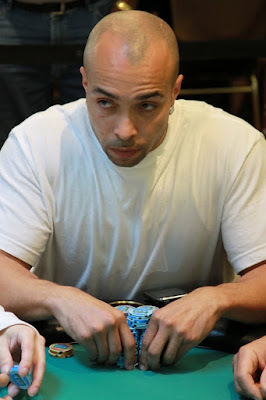 Leonard was eliminated in 10th place. The blinds have been increased for our final table to 25,000-50,000 with a 5,000 ante. We are now down to the final ten and players are redrawing for seats at the final table. Play will resume at 11:30pm. Tournament officials are coloring up the orange 1,000 chips. When play resumes, the blinds will be increased to 20,000-40,000 with a 5,000 ante. 2010 WSOP November Nine member and current chip leader at the WSOP Main Event final table, Jonathan Duhamel, just stopped by the tournament area to check out the action. Jonathan just arrived at Foxwoods and will be playing in tomorrow's Mega Stack Challenge Main Event along with Chris Moneymaker and Darvin Moon. Tommy Leonard, left, wanted to say hello to his boys John, Chris and Red. The 17 remaining players are now on a 10-minute break. When they return, the blinds will be increased to 15,000-30,000 with a 4,000 ante. 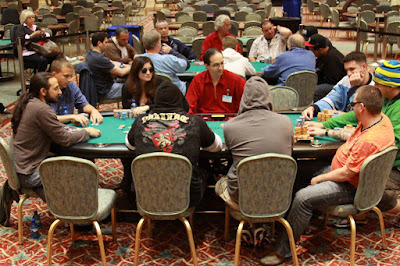 With 18 players remaining, the blinds have been increased to 12,000-24,000 with a 3,000 ante. With only 20 players remaining, we are now redrawing for seats at the final two tables. The final 21 players have returned from dinner break and cards are back in the air. The blinds are still 10,000-20,000 with a 2,000 ante. The 21 remaining players are now on a one-hour dinner break. The blinds have been increased to 10,000-20,000 with a 2,000 ante. With only 30 players now remaining, players are redrawing for seats at the final three tables. The 35 remaining players are now on a 10-minute break. When play resumes, the blinds will be increased to 8,000-16,000 with 2,000 ante. Brad Harper started the day with only 155,000 in chips. However, he has just become the first player in the $560 Mega Stack Challenge to cross the one million chip mark. This is the first live tournament Brad Harper has ever played in outside of home games! 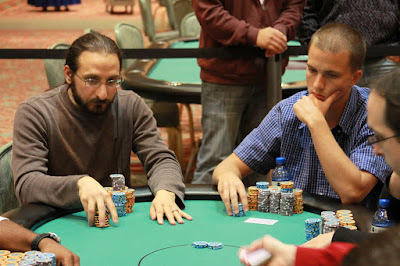 The turn came the [Qd], giving Eriquezzo the flush and leaving his opponent drawing dead. The [Ah] fell on the river and Eriquezzo raked the huge pot. Eriquezzo doubled up to just short of 800,000 chips and is now the new chip leader with 38 players remaining. 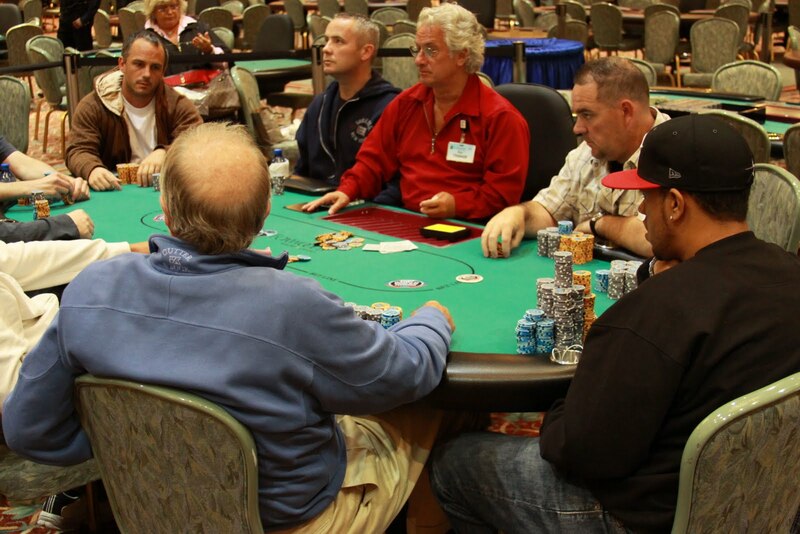 The players in the $560 NLHE Mega Stack Challenge are now on a 10-minute break. 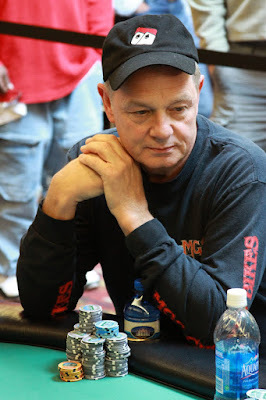 With 62 players remaining, the blinds have been increased to 4,000-8,000 with a 500 ante. After being crippled just before the bubble, 2009 WSOP Main Event Runner-Up and Mega Stack Challenge Host Darvin Moon got all of his chips in with A-J against his opponent's pocket kings. He was unable to improve and was eliminated in 68th place, taking home $1,286. 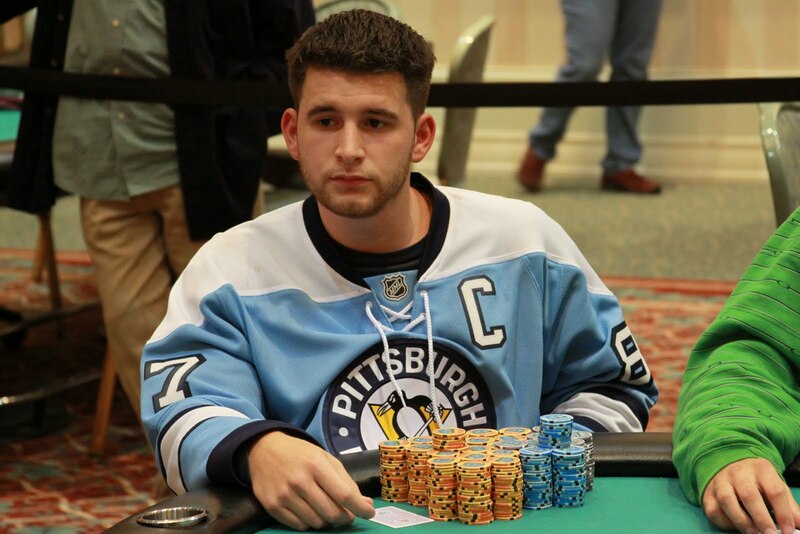 He will join 2003 WSOP Main Event Champion Chris Moneymaker and 2010 WSOP Main Event Final Table chip leader Jonathan Duhamel in tomorrow's Mega Stack Main Event.